CEMUS Research Forum is a transdisciplinary research forum open to researchers and PhD-students at Uppsala University, SLU and other universities in Sweden. CEFO activities focus on environment, development and sustainability studies. We collaborate with other universities and departments to enrich research education through our transdisciplinary Sustainability Seminars, PhD courses, workshops, lectures and field trips. CEFO was initiated by PhD-students, staff and students at CEMUS in 2002 as a research school between Uppsala University and Swedish Agricultural University (SLU). Meet PhD students from other departments, to present and discuss their research in an interdisciplinary environment. Connect their research to environmental and development issues. Get credits for participating in CEFO activities (on agreement with their supervisors). Propose courses, lectures, workshops and other activities. Get a short-term position as coordinators of PhD courses. To publish in CEFO Working Paper Series and/or act as peer reviewers for the Series’ papers. To propose and produce thematic anthologies together with other peers. To become formally associated as a PhD student, please fill out the form. Researchers and Master students are kindly requested to send a letter of interest, containing their name, department and information about their research to sachiko.ishihara@csduppsala.uu.se. PhD students associated with CEFO have proposed, developed and coordinated a variety of interdisciplinary courses over the years. The activities, courses and discussions at CEFO has resulted in some publications, namely these CEFO Anthologies. We are also currently working on an anthology “Co-creating actionable science: reflections from the field”. Friman, E. and Gallardo F., G. L., eds. 2010. 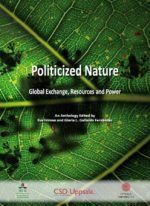 Politicized Nature: Introduction’ in Politicized Nature. Global Exchange, Resources and Power. Uppsala: Cefo Publication Series Number 2. Pp. 9-17. Gallardo Fernández, G. 2008. From Seascapes of Extinction to Seascapes of Confidence: Territorial Use Rights in Fisheries in Chile: El Quisco and Puerto Oscuro. Stockholm: Co-Action Publishing. Schulz, S.L. ed., 2007. Ekokritik: Naturen i litteraturen – en antologi, CEMUS Skriftserie Nr. 1. Uppsala: Centrum för miljö- och utvecklingsstudier. 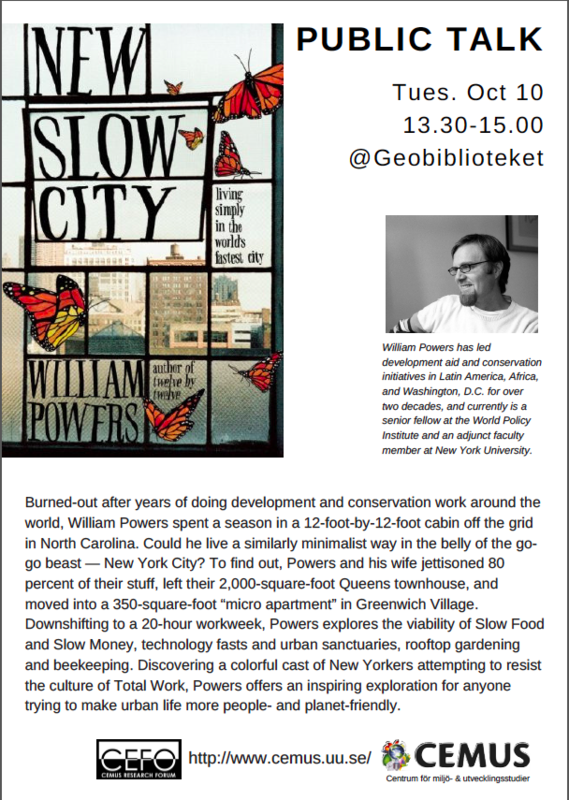 The seminar takes place every fortnight during term time in Baltic University Library at Centre for Sustainable Development, Villavägen 16. The first and last seminar each term includes planning discussions where PhD-students and researchers suggest future activities. In line with CEMUS practice of student-led education, all of CEFO’s activities are developed by or in close collaboration with seminar participants. 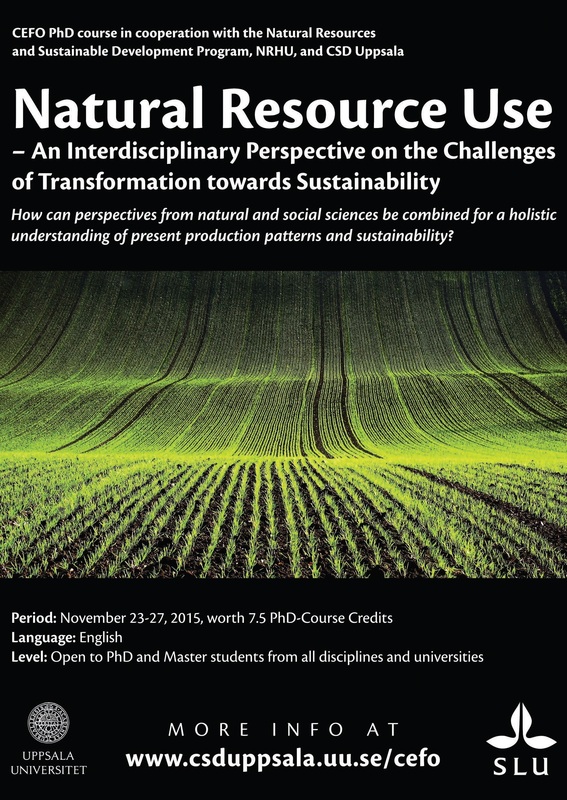 The seminars will take place at Baltic University Library at Centre for Sustainable Development (Villavägen 16), unless otherwise noted. 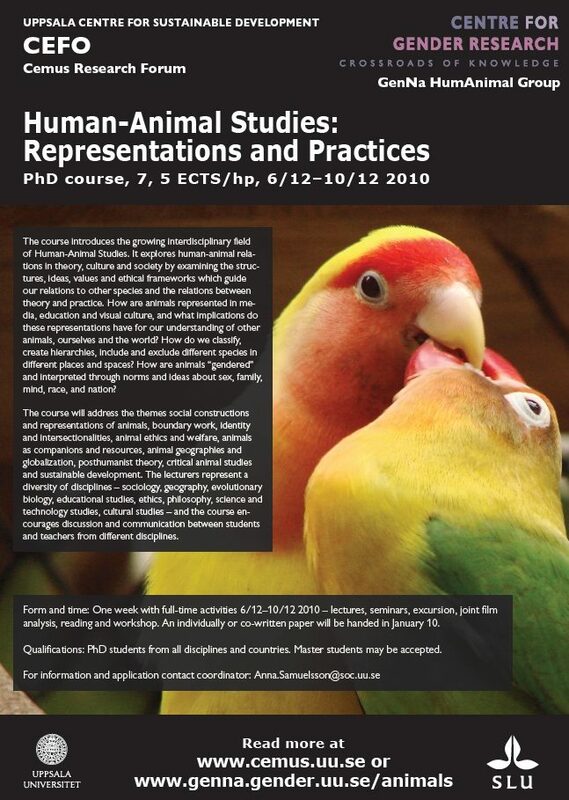 To receive information and papers for the seminars or for general inquiries, contact anneli.ekblom@cemus.uu.se. Download full schedule here. Presenter: Suvi Kokko (Department of Economics, SLU). The presentation had to be cancelled, and moved to another date in the Spring. Instead, we will have a planning meeting for how to organize the activities in the Spring semester. CEFO Workshop on Social Metabolism with Dr. Marina Fischer-Kowalski (Professor of social ecology, Alpen-Adria University Klagenfurt, Austria). The slides from her lecture “Decoupling environmental impacts from economic growth” is available here.